Organizations are facing the challenge of managing people effectively in order to boost organizational performance. In the competitive environment motivation of employees has become key determinant as to whether they are driven from within to work harder and help the organization achieving its goal or the force from beyond. When Philip Kotler visited India and was asked to add one more ‘P’ to McCarthy's well worshiped 4 Ps of marketing, his response was quick and focused, ‘it has to be People’. Dale Carnegie had said that for excelling business results 85% is People Management and remaining 15% is management of all other resources. 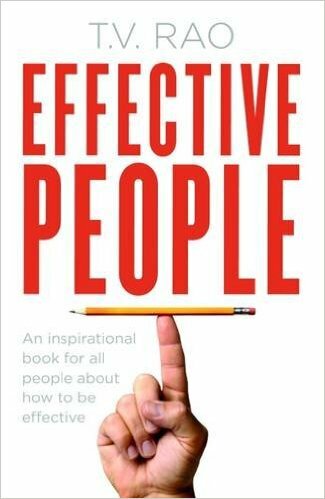 It is in this context that when I learnt about this title ‘Effective People’ by the father of HRD in India, Professor TV Rao, there was no second thought but to find his take on the ways that help improve effectiveness of people. The selection of people has been his personal choice based on the above criterion and further through engagements on social media apart from the literature that he went through reading the works of authors who have written on successful and effective people. I would like to divide the book into three sections (though the author has not done that). First section as the Background (Introduction – Chapter 1), Second as Profiling Effective People (Chapter 2 to 8) and Third as Takeaways or Lessons (Chapter 9 to 16). The book profiles effective people in seven categories viz., Doctors, Film Actors, Civil Servants, Educational Entrepreneurs, Professors, Social Workers, and Other Professions. Out of all the doctors that he profiles and brings out their propositions for being effective doctors, Dr MC Modi (Ophthalmologist), Dr Pratap Reddy (Cardiologist), Dr Devi Shetty (known for open heart surgeries), and Dr Naresh Trehan (Cardiovascular & Cardiothoracic surgeon) stand out and their common purpose to save lives along with strong determination to leave behind a rich legacy make them effective. The lives of film actors like Anupam Kher, Kangana Ranaut, Amitabh Bachchan, Aamir Khan, and Shah Rukh Khan have been narrated with their contribution and achievements. Though they play the role as assigned to them, as individuals their work behavior, commitment, style, and discipline make them effective. The roles they have played have left the audiences with some strong messages to carry and practical values to follow in order to remain effective. Managers can really learn lot from their life journeys, their characters, and their personalities. Learning from failures is a very strong message that one draws from the story of Amitabh Bachchan. Personal involvement of the author with the civil servants for developing better education system provides insights into the lives of some prominent civil servants who displayed their commitment to the cause of educational well-being of India. The names of Inderjit Khanna and Anil Bordia stand out as effective bureaucrats who played their role in drafting key education policies and spearheaded such initiatives. Apart from them the profiles and journeys of N Vittal (a civil servant known for his concern for transparency), Vinod Rai (CAG who walked extra mile to unearth some infamous scams like 2G, CWG, Coalgate etc), D R Mehta (bureaucrat who had strong concern for social causes), E Sreedharan (bureaucrat turn Metro Man), Kiran Bedi (first lady IPS and social activist), K P C H Gandhi (known for his contribution on forensic sciences and zero pendency), Arvind Kejriwal, Jaiprakash Narayan are narrated with the lessons that a manager or any person who want to be effective can learn. All these people are said to be restless, hard working, having development goal in mind, strongly driven by their value system, innovative and creative. The learning from effective people in the category of educational entrepreneurs is that all of them thought differently and had a strong desire to create an institution which caters to the educational needs of society. The knowledge of the task, will power to face the challenge, and the ability to engage with the stakeholders could make them effective as educational leaders. Effectiveness lessons drawn from the experiences of professors are placed succinctly as in-depth knowledge, commitment to the cause, innovativeness in thinking and delivery, strong sense of institution building, and proper succession planning through creating and patronizing next generation professors. All the chapters profiling different professions ended with effectiveness lessons and an interesting exercise having Self-Assessment Tool based on profession specific effectiveness requirement which one could assess based on five point Likert scale. This makes the book rich, valuable and practical. Personally I really liked all the tools given as they provide strong variables for judging effectiveness of the profession viz-a-viz., individual. 1. Effective People Think Differently (Chapter 9) - so one has to find out one’s inner talent through experimentation and concentrate on capitalizing on that through thinking differently. 2. Effective People Stretch Their Talent (Chapter 10) – exploring new vistas and opportunities by stretching the limits in different situations. 3. Effective People Consider Values as Core Drivers (Chapter 11) – being firm in matters of principle and maintaining high value standards which are result of bringing up (family and environment) without succumbing to pressures and establishing superordinate goals. 4. Effective People Are Compassionate (Chapter 12) – sense of togetherness and concern for others coming through empathy. 5. Effective People Live With Purpose (Chapter 13) – strong commitment to the purpose as per their vision, mission and goal helping in achieving the goal. 6. Effective People Reach Out to Many (Chapter 14) – looking outward and connecting with the stakeholders through different modes by being perseverant and positive. 7. Effective People Take Initiative and Build Institutions (Chapter 15) – displaying strong sense of initiation and responsibility to build great institutions to contribute for good and sustenance. 8. Effective People Are Integrative Not Divisive (Chapter 16) – inclusiveness and not exclusiveness to be practiced at all levels by imbibing virtues of integrating personality leading towards organization building viz-a-viz nation building. These are all virtues for becoming effective. All these chapters also had series of questions at the end guiding the reader for search and resolution within in order to be effective. The examples as narrated by the author are exemplary and are very practical and many of them come from management institutes, Bollywood movies, cricket world, bureaucracy and government system. Almost all the individuals profiled in this volume have created great institutions. I was expecting a detailed profile of TN Sheshan who redefined the role of Chief Election Commissioner in India and ever since the whole process of conduct of elections in India has undergone transformation. The book is autobiographical at many places which makes it very selective yet interesting part of the book is its first person narrative as a style of writing. All the lessons are fully applicable for any manager working in an organization be it profit making or otherwise. And to that end this project of the author is successful in guiding all its readers. The author mentions - My aim is to write a book that can help many more people to become effective (p 13). I am sure it really makes lot of sense and would certainly be a practical guide for all its readers. People are important resource for any organization and this book makes an effective effort to teach the nuances of leading and being effective. I strongly recommend this title to all the libraries and to all who aspire to achieve greater heights in their professional career or entrepreneurial venture.